Ever since I can remember, I've always thought that Eldar were cool. Of course I went with the safe bet and played Marines but I still remember the first time I saw them. I've always said I was going to play some army other than Marines one day. Well, with my recent take from a swap meet at my FLGS, I have the money to get started on my first Non-Marine 40k army. Since I recently started playing Doublewing, I've realised I like armies that can maneuver around the table. I also like low model count armies that can be fragile and unforgiving if you make too many mistakes. Fritz over at Way of Saim-Hann has been a great help in getting me started with my new army. He's helped me with a workable 1500 point list. So far, I have the Codex and 27 jetbikes. I'm going to build my way up to a finshed force. Come to find out, an all jetbike army can be somewhat expensive. Good luck with the Eldar, it's always nice to have a couple options on what to work on project-wise. Saim Hann armies always look awesome on the table too! I look forward to seeing how you get on with the Eldar. They do have some cool looking models. I'm very excited to see this army come together. I've got a few jetbikes and vypers in boxes for such an army one day. Thanks guys, I still need to buy a handful of Vypers to finish out my list. I've got my White Scars to work on still but it's just painting left to do on them. I'm going to magnetise all the flying stands that way I can store all the jetbikes a little easier. I realy want to get started building and test paint one model to see how long it's going to take for the rest but I'm trying to be patient. Since following Fritz's blog, I have also been tempted by Saim Hann, mostly because it would make an interesting alternative to my green Tau army. Yeah, Saim-Hann are cool, because are eldar but wild, fragile but brave! Good look! I will look forward for your Saim-Hann army! For 5th edition, Saim-Hann combine cool and effectiveness (and like everyone else, I've been very impressed by Fritz's blog). 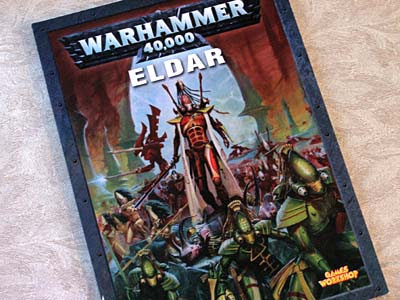 I know what you mean about the Eldar, they have always held a part of my interest, but for some reason I have always held off, maybe due to other projects etc. Good luck with finishing them up, I'm sure they will be very effective on the board! can we expect any pics of your jet-bikes so far? So will you be painting your force as a Saim-Hann army (ie red and black)? Or will you use another Craftworld with a different color scheme? Wienas: I'm going with the "classic" Saim-Hann color scheme, I think it brings much more psychological baggage with it as opposed to some much lesser known craftworld. Intimidation is the key when you've only got a few models. I always have problems with that colour xD Might have to do with my impatience... (never give it time to dry). as for the pilots in your vypers, how about painting them completely, THEN you make the glow effect? Mordeth: I always wanted to try painting red and using the GW washes. Fortunately for me, I was able to combine the two and make it a quick process at that. I won't win any awards but overall they look pretty good for tabletop.